Bimbavati Devi, being the daughter of renowned classical Manipuri dancers, Guru Bipin Singh and Smt. Kalavati Devi, was initiated into the world of dance and music at a very tender age. Besides dancing, she has also undergone training in pung (Manipuri mridang) playing and Thang Ta (Manipuri martial art). 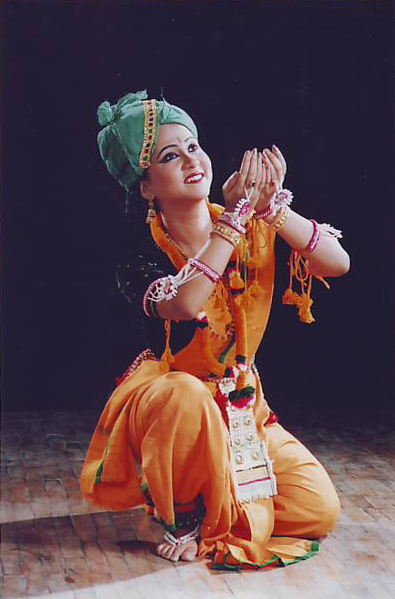 As a solo artiste and as a performing artiste of Manipuri Nartanalaya, one of the pioneer institutions of Manipuri dance in the country founded by her parents and the well-known Jhaveri sisters, she has performed in various prestigious dance programmes and festivals of India and abroad. Besides being a classical dancer par excellence, Bimbavati is now engaged in contemporary choreographies based on Manipuri dance, even trying to experiment with new idioms and thus trying to expand the vocabulary of movements, following the path shown by her father. Khajuraho Festival, Konarak Festival, Swami Haridas Sangeet Sammelan, Vrindavan Sharadotsav, Uday Shankar Festival, Nishagandhi Festival, Vishwa Banga Sammelan, Soorya Festival, Kal-Ke-Kalakar, Ghungroo Festival, Temple Festival, Dances of India Festival, programmes organized by the Indian Council for Cultural Relations (ICCR), India International Centre (IIC - New Delhi), India Habitat Centre (New Delhi), Asia Festival in Helsinki (Finland), Nehru Center in London (England), Banga Sammelan in Lowell, Festival of India organized by the Asian Dance and Music Program, University of Massachusetts, programme organized by the Musee Guimet (National Museum of Asian Arts), Paris, workshops and lecture demonstrations at North Dakota State University, University of Massachusetts, National University of Singapore, programmes and workshops organized by well known dance organizations of USA, UK, Canada, Singapore, and Australia. A recipient of Senior National Scholarship in Manipuri Dance from the Department of Culture, Govt. of India. A recipient of Junior National Fellowship in Manipuri dance from the Department of Culture, Govt. of India. Title of Shringar Mani conferred by Sur Singar Samsad, Mumbai. Recipient of Nandita Kripalini Award from West Bengal State Academy of Dance, Drama, Music, and Visual Arts, Govt. of West Bengal. Empanelled artiste of Indian Council for Cultural Relations (I.C.C.R), Govt. of India. Sanskriti Award given by Smt. Sheila Dikshit, the Chief Minister of Delhi on behalf of the prestigious Sanskriti Foundation, New Delhi in 2004 for being one of the upcoming and promising dancers and choreographers. Aditya Birla Kala Kiran Puraskar 2007 conferred by the Chief Minister of Maharashtra, Shri Vilasrao Deshmukh on behalf Sangeet Kala Kendra, Mumbai. Ustad Bismillah Khan Yuva Puraskar 2008 from Sangeet Natak Akademi, Govt. of India. From 2008 to 2011 she is on a Cultural Deputation of the Indian High Commission in Bangladesh.